It’s now Sunday, and I’ve been in Andalucia since late morning on Thursday. The two main observations I’ve made so far are that it’s very beautiful and that it’s flippin’ hot for the first week of May! This map shows just how many rivers there are in Andalucía. 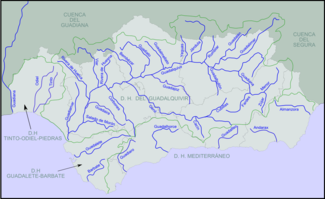 The one that features in Book 3 of my Sons of Kings trilogy is the Guadalquivir – the longest river in Andalucia, with innumerable tributaries. 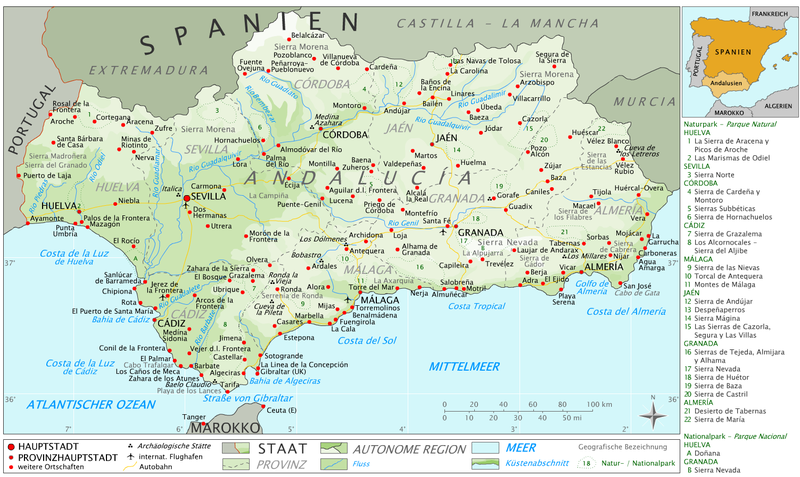 It flows right across northern regions of Andalucía and out through its delta into the Atlantic Ocean. Of course, rivers were very important to my intrepid Vikings, who were heading for Cordoba, on the Guadalquivir. Since Friday we’ve been in Seville and both today and yesterday it’s been well over 30°C. Now, that may not sound hot for this time of year to all you people who are treated to weather like this every spring. But to someone from the north of England, it’s like walking into an oven every time I step out of the hotel door! I’ll probably do a post about Seville later on, but today I just want to post a few photos of two smaller towns we passed through after landing at Malaga. 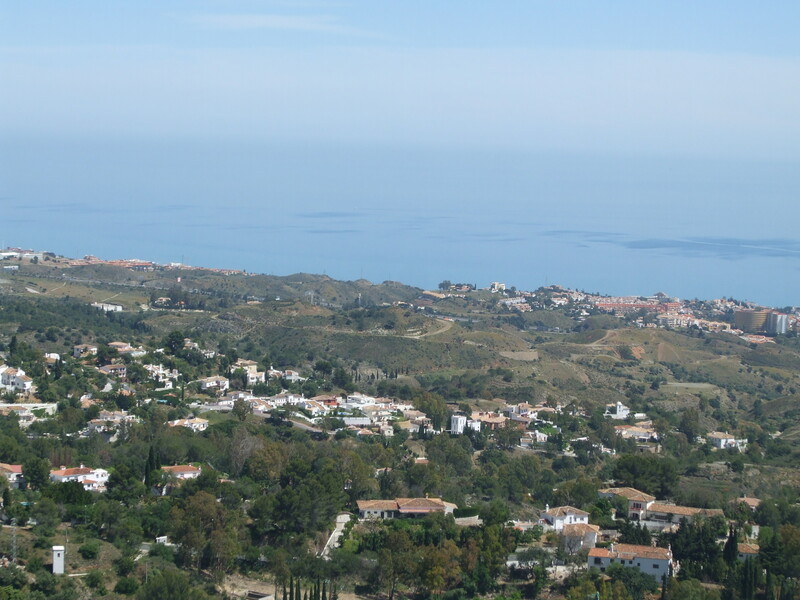 The first was just a visit and overnight stop in the tiny village of Mijas, situated twenty one miles to the south-west of Malaga. It’s a lovely, typical old, white-washed Andalucian village, nestling high on a hillside with wonderful views over the Mediterranean coast. 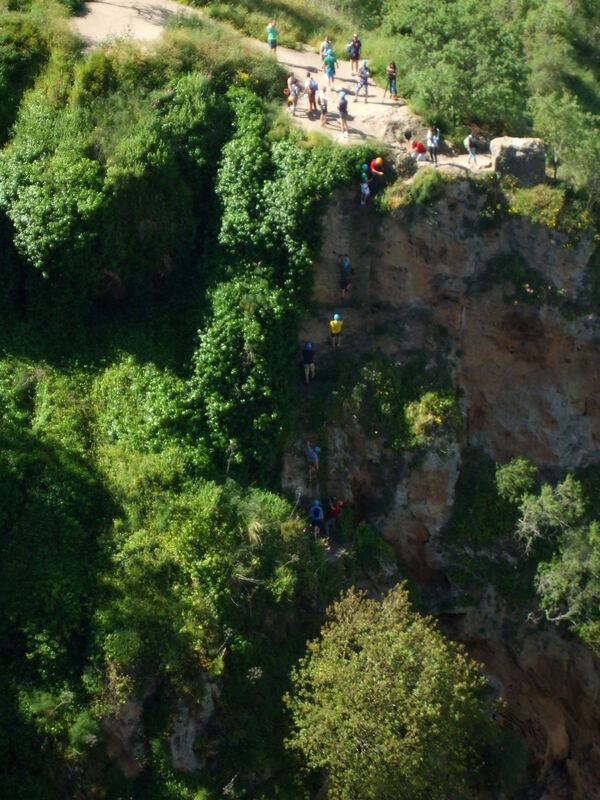 The following day we continued on to Ronda, just thirty one miles from Mijas. Ronda is of the most ancient cities in Spain, and is quite a stunning place, cut into two by the deep gorge of the River Guadalevin. On one side is new Ronda and the other, the ancient city. 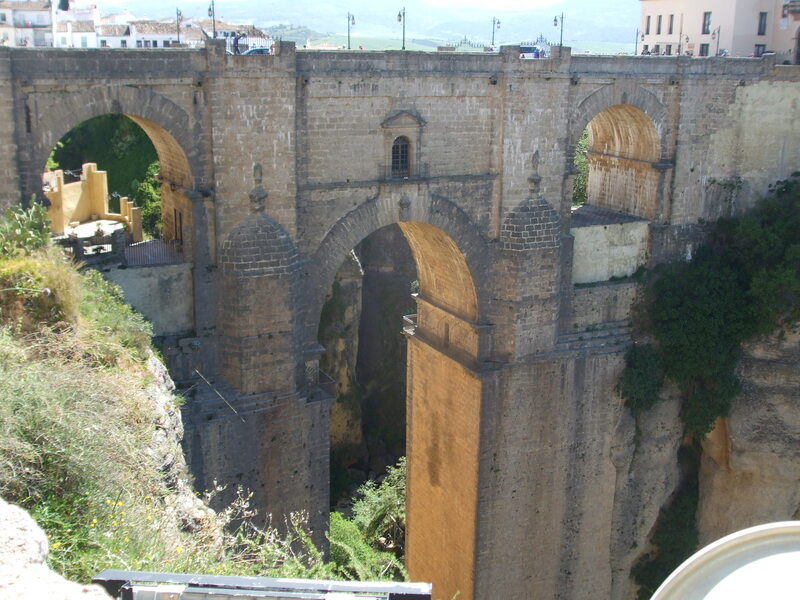 Both sides are joined by the Puente Nuevo bridge, (New Bridge) built between 1751 and 1793. Here are a couple of photos of the gorge and bridge that we took. 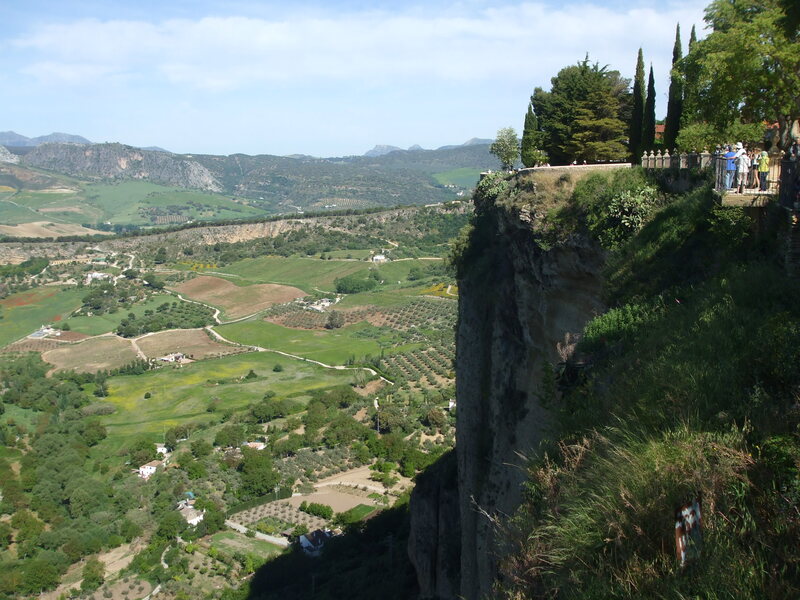 Ronda’s main claim to fame is that it has the oldest bullring in Spain, and even the world. The first fight took place in 1785. On Monday we head for Cordoba for a few hours, before moving on to Granada for our last two days. Sorry for the late reply to comments, but it’s hard to find the time when on holiday. Anyway, it’s Tuesday now, and things have cooled down a bit since the weekend. We’re now in Granada, which is much higher up, so it’s a very nice 20C today. Hi, Khloe. Yes, it’s a wonderful trip and I’d happily stay here another few weeks. But that’s not to be, and I have book to finish! We’ll be home again by late Thursday night. Funny you should mention summer cloaks. I believe I mentioned them in Book1 when King Aethelwulf and young Alfred visited Rome. You have a vey good memory. With your love of history, you’d love it here, Jack – if you haven’t already been. :) I know you’ve visited a lot of interesting places worldwide. The Moorish architecture is just stunning. I believe you did certainly reference summer cloaks. 🙂 Spain is a country I’ve not visited, milliethom; and I agree with you on the Moorish architecture and its intricate beauty. Hope you are having a wonderful time. Great pictures! Enjoy the sun! Great pictures Millie! Thanks for sharing.. Looking forward to your other posts on your trip. Absolutely stunning photos, Millie! Such a beautiful piece of the world! I imagine it is providing wonderful inspiration for your writing! Keep sharing! Hello, fellow travel-lover. It’s lovely to be able to share such great views – as you do yourself on your blog. And yes, we came here for me to get a feel of what it would have been like in the 9th century and it’s been wonderful for that. The Moorish architecture is so beautiful. So fantastic! Thanks for sharing Millie! Thank you for liking it, Elizabeth. It is really lovely here and I know I won’t want to go home on Thursday. Another month would be nice! Looks beautiful there. Thanks for sharing this lovely trip with us. Thank you Scapydo. :) It is very beautiful here. 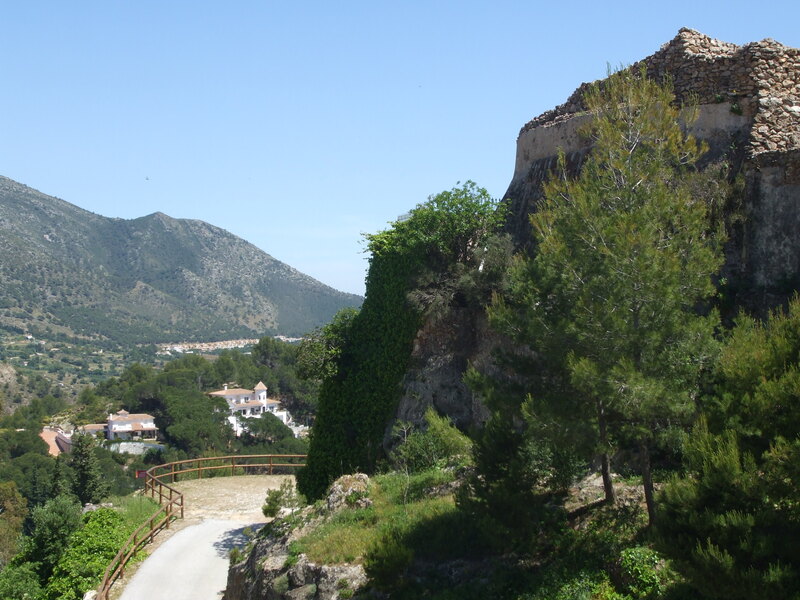 Spain is such a colourful and vibrant place – although it’s vey crowded with tourists. And it isn’t even the high season yet! I’d steer clear of June to September. It would be too hot for sightseeing then, anyway. I was only 12 when I visited Barcelona for a day, so I don’t remember too much about it. We were staying in Sitges, further along the coast. All the Spanish cities are wonderful, though. I think Columbus went to Barcelona to meet with the king and queen, Ferdinand and Isabella, didn’t he? Thank you for sharing that, Scrapydo. That’s it! I stood where C met the king not far away from the steps of the kings palace! Today the shore is far away from the steps and built with buildings along the shore. You still could see the sea and shore. They also have a replica of his ship in the harbour nearby. Wonderful history! It definitely is! It sounds as though you had a great holiday in Spain, too. Thanks, Norma. 🙂 I’m enthralled by the scenery here, as well as the busting towns. Andalucía is quite rugged in parts. Great trip you are having. Those cliffs are awesome. 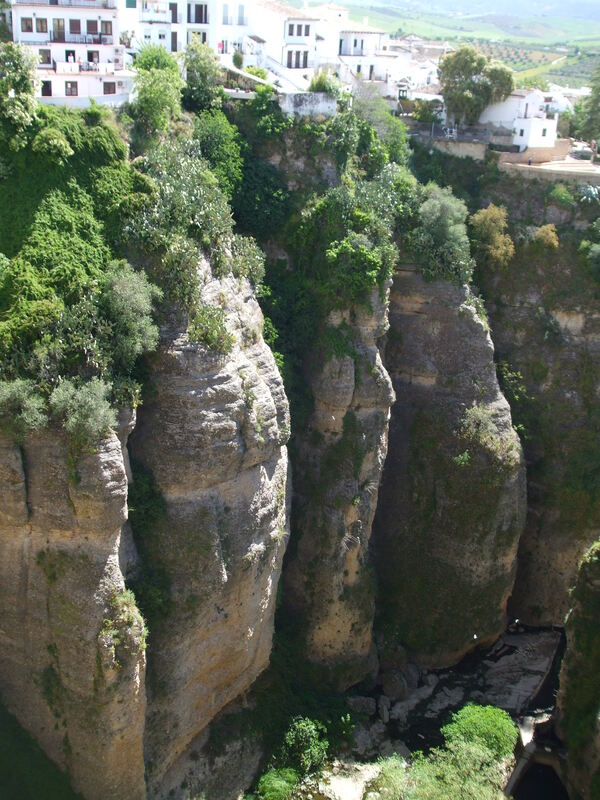 Ronda’s main attraction is its gorge. It is pretty spectacular, especially as it splits the town in two! Thanks, Amanda.